It’s almost 8pm and I haven’t posted yet today. 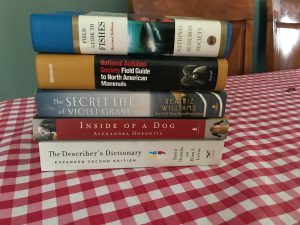 This is the first day so far in this Ultimate Blog Challenge, that I haven’t pre-scheduled or at least pre-started a post for a day. I have a couple ideas for posts, but they require a bit of research and preparation. So instead of scrambling to put a post together last minute, I thought I’d explain why I didn’t make the time to do it earlier! 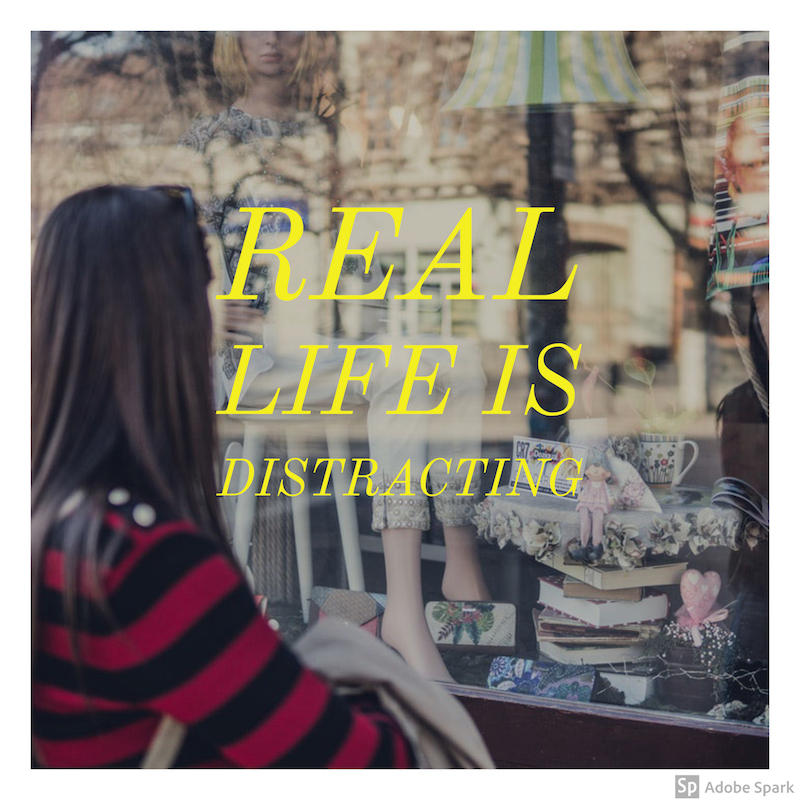 Because, you know, real life is distracting! Holy cow this book is occupying all of my time and my thoughts right now! I can’t stop listening to it. I started it yesterday morning and was almost 50% finished before I went to bed last night. That’s a good sign! Today I listened to it every moment I possibly could. It’s an incredibly compelling, emotional story about the daughter of a Evangelical Pastor whose family is a full time reality show. She finds herself pregnant at 17 and desperate for an escape from the family. 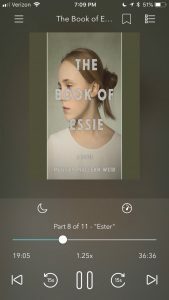 All I want to do is listen to Essie’s story! Second distraction of the day: I went thrifting after my doctor’s appointments, which I often do, to lift my spirits. I find 60 pounds of weights my husband has been wanting for his new weight bench for a total of $12, which is a great find. 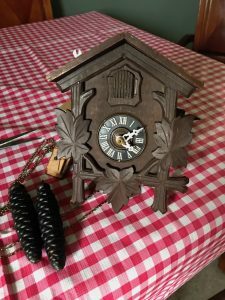 Even better than that, I found what looked like a cuckoo clock in a bag for $6 so I took a chance on it.I got home and discovered it is in fact an real wood German cuckoo like I have been wanting for years! It’s a bit banged up, which I suspected when I bought it, but a little interneting turned up plenty of sites providing parts and guidance for repair. My husband and I have decided this will likely be a winter project for us, which is super cool. I also found some great bookish treasures today. All of these for $6.50! 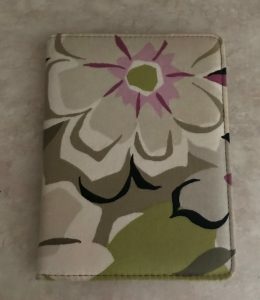 Plus a cute little cover Vera Bradley for my Kindle (for 99 cents!) I’ve been looking for a new one with a pocket to hold a Tile, and The Universe provided! And now I’m off to more of The Book of Essie before bed! I’ll be back tomorrow with a more interesting blog post. Unless of course I get distracted……. Looks like you deserved to be late. I love the cuucu clock! That would be a great blog topic, before and after you get it cleaned up! Thrifting is such fun…you never know what you will come across that you just can’t live without. Great idea! My husband and I are super excited to get started on it! Great way to reframe it, thanks! Agreed! I go often and find a lot of joy in it. I usually don’t buy stuff that’s in need of repair simply because I used to do that and it led to a pile of unfinished projects sitting around. I followed my intuition on this one and was thrilled to see how excited my husband was when he saw it! Ramona, this was a clever way to get a post in today. I love this idea. And good work on not letting the day go by without making it happen.